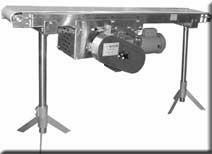 Stainless Steel Belt Conveyors – Northwest Conveyor Inc. The MCC low profile conveyor util izes a 4” lagged drive pulley in a center drive configuration. The center drive assembly can be mounted to any intermediate section. The 2” end terminals are bolted to the intermediate section(s) to complete the conveyor. For lengths greater than 30 feet, consult a conveyor specialist.